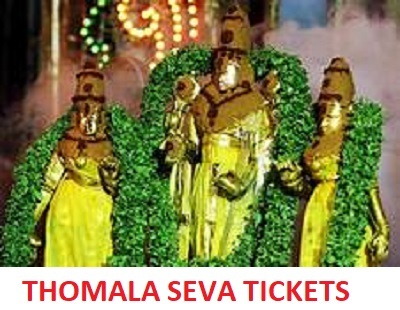 Thomala Seva tickets online booking in Tirumala Sri Venkateswara Swamy Temple. Book TTDSEVAONLINE Thomala seva tickets by Luck Dip Registration. Check Thomala seva price, availability, booking process. Tirumala Srivari temple is one of the most holy, important & Spirtual places in India. It attracts highest number of devotees than any other place in our world. The revenue generated interms of donations, tourism and collections is very high. In this temple Lord govinda will get more than 14 types pooja, rituals etc. Devotees can participate in those Arjitha sevas by taking specific tickets. Every day Thomala seva is conducted in morning and evening at 4:00 Hrs. Thomala Seva means Tulasi leaves sacrifice and ritual to gods idol. Devotees are allowed to participate in morning session Thomala seva on Tuesday, Wednesday, Thursday only. Tickets are sold 10 in online, 10 in current booking at TTD service centers. Advance booking people left over tickets are transferred to Random allotment in TTD CRO office counter. Total 80 to 100 participants are allowed per each day morning Arjitha seva. Every time Tirumala Thomala seva tickets are issued month wise in lucky dip. Every registered user can apply for lucky dip to get thomala seva tickets. They can also apply for couple tickets. Ticket cost is 220 per each person. Selected list is released on second Tuesday at 12:00 PM after every first friday. Schedule is udpated on the home page. Visit the CRO lucky dip registration counter near to Vijaya Bank counter. There enrollments are accepted from 11:00 AM to 5:00 PM. Results are declared after random selection at 6:00 PM. SMS alerts are sent to registered mobile number to report for tickets. In this way you can get the Thomala seva tickets at normal price. Reporting time: 03:00 AM on scheduled date. Prasadams offered per each ticket: 2 small laddus. Seva duration: 25 to 30 min. Darshan specialities: All participants are given satari, Harati & VIP Laghu darshan. Reporting gate: VQC Gate 1 same as all arjitha sevas. Was TTD is releasing the Thomala seva tickets in online without any lucky dip. Please update the information here. Best seva is thomala seva to book in ttd website. You can get with the lucky dip released first friday in every month. The best arjitha seva ticket to buy or participate in Tirumala is Thomala seva. We can see the lord idol for 25 to 30 minutes. Thomala is the costilest seva to book in black. But even there it was not available because of the sever action by TTD. They cancelled the advanced booking tickets after 2028. Thanks for the Thomala seva tickets online booking in ttd website information. Please share any quick steps to follow for confirmed booking sir. Thanks for the information about TTD Thomala seva tickets online booking. Please give the next date when the tickets are released. Great information about TTD Thomala seva tickets online booking. I have got the thomala seva ticket just by enrolling into ttd lucky dip in April. Thanks to this admin for posting such a good news. Do they allow four people for couple tickets in Thomala seva. Last time children are not allowed as they do not have aadhar card with us. TTD is the best website which provides Thomala, Archana, Suprabatha darshanam for everyone. Last time i did not get a chance to see the tickets also. Tirumala is the big devotional center in the world. Last time I got the thomala seva in Random allotment when enrolled at CRO office. I traveled from nellore to tirumala again for participating in the darshan. People can see the rituals and poojas dones in Thomala seva with their own eyes sitting infront of the idol. Is is an pleasureful and unique experience. May I get thomala seva for my family on 7th October 2018 . Last time my mother got this opportunity in random selection and she saw this pooja with her own eyes and now we want this opportunity for us…. i want thomal seva tickets for me my wife and three children. how do i get them? ttd seva online website never opens. what to do ?